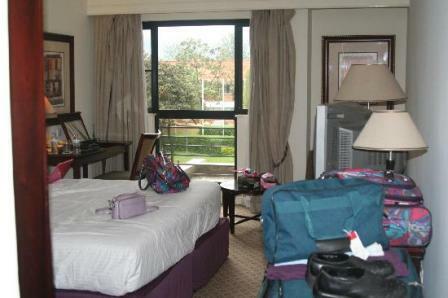 The Churchill Courts hotel is in Guru Town Uganda is new and well built. I loved the room I stayed in. The bed was cozy to sleep in. There were some basic facilities like television, furniture, telephone, mosquito net, etc in the room. Those were enough for a short stay. For I did not stay for a long time at this hotel, it was just a one day stay. The staffs were friendly and helpful. The food at the restaurant was fine. The chef tried his best to make me the recipes that I wanted with the limited ingredients stocked in the kitchen. That was very kind of him. Bed is so so, and came with mosq net. TV worked, and there was a fan and phone in the room. Shower takes ages to get to hot, but was usually able to get hot water eventually for as long as I needed it. As is typical of Ugandan restaurants, few items on the menu are actually in stock, and there was a screw-up on nearly every order, no matter how many times I repeated myself. They will make you what you want, from among the ingredients they have (which are admittedly limited), but they try. Dining room and kitchen staff are really friendly, and Denis deserves mention in particular; and breakfast is pretty good. Nice dining area, inside and outside. Over all a good place to stay when in Gulu.